Above the Backlog, next to the + ADD NEW USER STORY button, click . 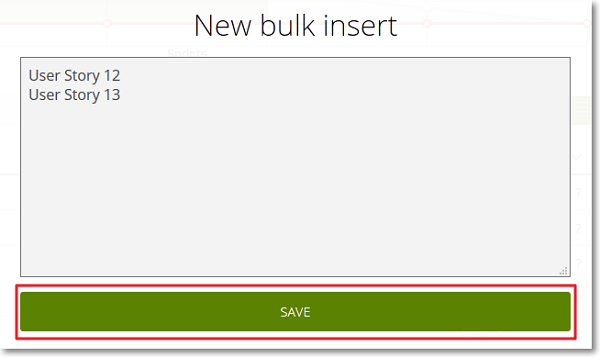 This action opens the New bulk insert form. On the New bulk insert form, enter the Subjects of the new User Stories, one Subject per line, and then click SAVE. The new User Stories are added at the bottom of the Backlog with the default Status and default number of Points (which have been set for the current project on the ADMIN module – for more details, you can go to Default values). If the KANBAN module is available, the new User Stories are also added on the first column of the KANBAN chart.